The coffee table is a convenient and useful design that can stand not only in the living room, but also in the hallway, bedroom, even in the kitchen. This piece of furniture can be given an unusual appearance, its design entirely depends on the interior and the overall style of the room. The coffee table can be easily made literally from scratch, using various objects and materials. But you can restore the old table, completely transforming its surface. Do not rush to throw away old furniture. A bit of fantasy and seemingly unnecessary thing acquires a new life. 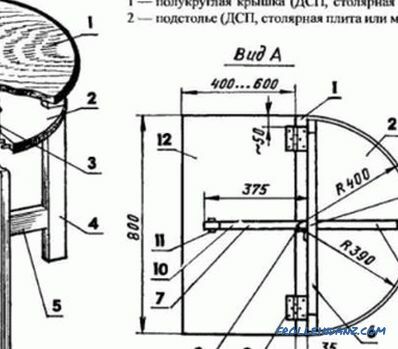 The design of the table can be performed by various methods. Usually, the old construction is restored, after which the tabletop and legs are painted. Everything is not so simple, the design of the future table depends entirely on the style in which it will be made. For a modern interior, you can use bright and intense colors, and for a classic, dark or light shade stain and lacquering are better suited. Much depends on what kind of shape the table will take. For example, the original design with your own hands can be quickly assembled using only old books, a metal pipe and a couple of sheets of plywood. This table is perfect for any interior. It will be the centerpiece for a classic setting in a library or home office, and it can perfectly fit into a modern, bold style and become an unusual detail of space. Books are glued together with glue and painted with bronze paint. Each house has a dozen old books that are unlikely to be useful. Most often these are textbooks, information in which is outdated. It is possible to use old reference books and other books for this, simply wallowing at all without doing anything. They must be strong and have a sufficient thickness, the size is chosen about the same. 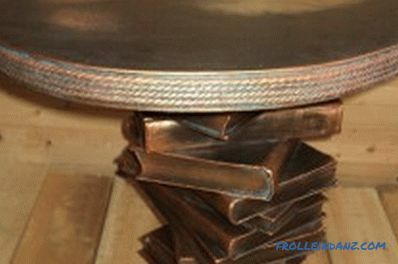 You can create an unusual coffee table from your own books and decorate it in bronze. Metal bar with a thread along the entire length. Its length should be 600 mm and its diameter should be about 6 mm. 2 washers per 20 mm, 2 nuts M6. Clamps in the amount of 3 pieces. If not, then you can replace it with any other cargo. Acrylic primer in black - approximately 400 g.
A small set of acrylic paints of basic colors. Plywood sheets of different thickness. You can take unnecessary furniture backs, which are usually stored on the balconies, among other things "just in case." The worktop is pre-painted with bronze paint and attached with glue to the leg of the books. First you need to fold the books in the form of a column, and their angles do not have to be the same. You should get an attractive column with corners that look in different directions. After that, in the center of the resulting column, it is necessary to make a hole about 3 mm larger than the diameter of the rod. During the drilling of such a hole, you must ensure that it passes through the center of the column. Then the same hole is made for 2 sheets of plywood, which will serve as a tabletop. Next, you need to push the bar through the hole, at this time it is best to alternate large and small books, to direct their corners in different directions. After that, the design is tightly clamped. 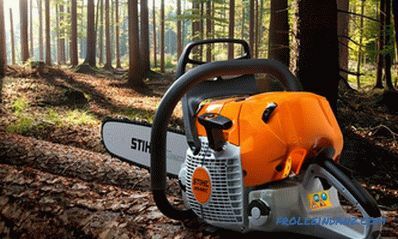 It is necessary to additionally prepare another 2 plywood sheets, in the center of which there will be a hole with such a diameter that a nut and a washer can fit in it. Now you need to glue the entire structure with prepared glue. 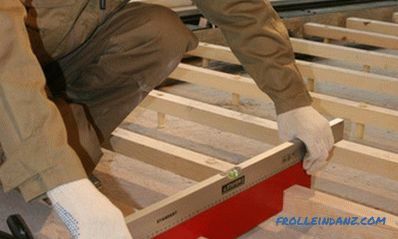 It is important that the table leg turns out to be stable, so after sizing plywood sheets and books, it is necessary to turn the design over with plywood down, press it with clamps or a load. The construction will dry for 2 hours at a minimum, but it is impossible to continue work until the glue dries completely. The workpiece is reversed, it is necessary to use a mixture of glue and sawdust for the bottom nut, it completely fills the mounting hole. The same work is done for the countertop. Dense pipes are made of old magazines on which a glass worktop is installed. After the glue dries, you can proceed to painting the table under bronze. 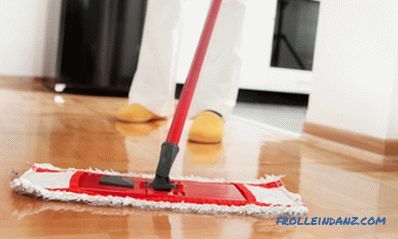 It is desirable to do this on the floor, which is covered with plastic wrap so as not to stain its coating. First, a special primer is used, it needs to be given a chocolate shade. Make it easy, you need to add basic colors to the black prepared soil. Green, red, orange, blue are mixed with black soil.Colors should be added gradually, thoroughly mixing the primer to get exactly the shade that is needed. 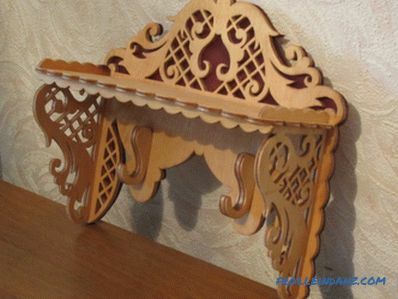 Next, you can start painting with a brush, giving the desired design and color to this piece of furniture. If there is a sprayer, then it is best to apply the paint to them, since the brush will not work well to paint over the sides of the books, and this will make the surface of the table not so attractive. The next stage is coating with bronze paint, for which it is necessary to wait for the ground to completely dry out. The paint is applied with a wide brush, the layer should not be very thin, but it should not be made too thick. To get an unusual look, it is best to apply a spot brushstroke. The method of aging makes the table more stylish. The black primer shines through the bronze, creating the necessary impression, but the outer layer of paint turns out to be too even. 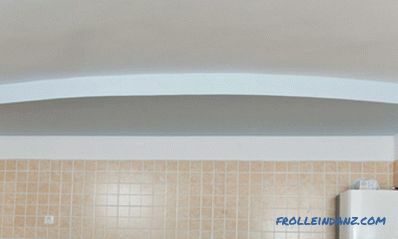 If the design requires a slightly aged surface, then it is best to darken the corners and valleys. To do this, mix white, blue, green paint, the composition is applied to the places where aging is necessary. Smears should be made slightly careless, so that they do not have clear boundaries. On this construction of an unusual and vintage look is ready. 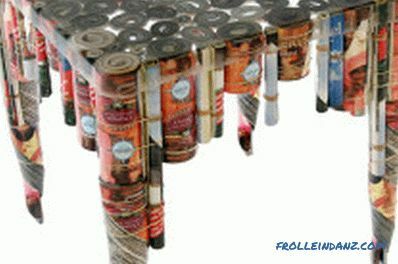 You can make an interesting model from newspapers and magazines. 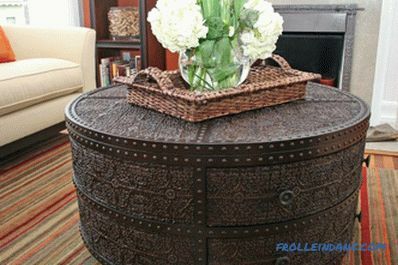 Decorating a coffee table is a creative process that can bring a lot of fun. You can use for this a variety of materials and tools. The level of difficulty depends on what end result is needed. The simplest option is to use ordinary paint; with its help, even a boring table can become bright and stylish. How to make furniture yourself. 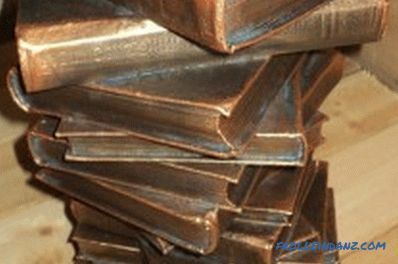 What are the materials, and what is their difference? Variants of the drawings, as well as a description of the manufacture of an example. What else do you need to know when deciding to do this kind of work? It is quite possible to build a wooden garage with your own hands, and in a fairly short time. 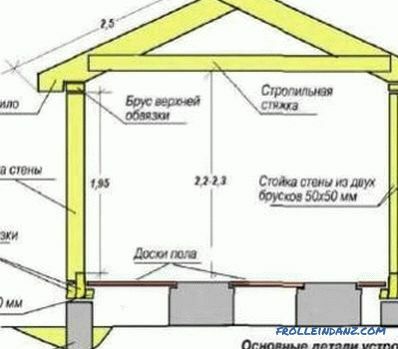 How to build a garage frame type: recommendations for the execution of works. Walls, floor, roof of the garage.